The title says it all. I realized as I set out to plan and create a natural dye garden this winter that I have never successfully grown a plant in my entire life other than the occasional house plant. (Which usually didn’t survive.) These experiences lead me to believe that I ‘just don’t have a green thumb’. Well, I set out to prove myself wrong and so far I’m doing a great job! I can’t believe that almost all the seeds I’ve started have flourished. It has been quite the learning experience so far and the plans aren’t even two inches tall yet! Even finding a watering can was a challenge. You wouldn’t believe how many stores don’t carry small watering cans. I am eternally grateful to everyone that helped me out with equipment, advice, and moral support. I know it may not have seemed like much, but I experienced a lot of self-doubt when it came to this project and your support made this a success so far. Thank you so much! 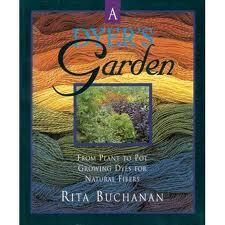 Also thank you to Rita Buchanon’s book, A Dyer’s Garden. It really helped me think about which plants would provide the most color while taking up little space. 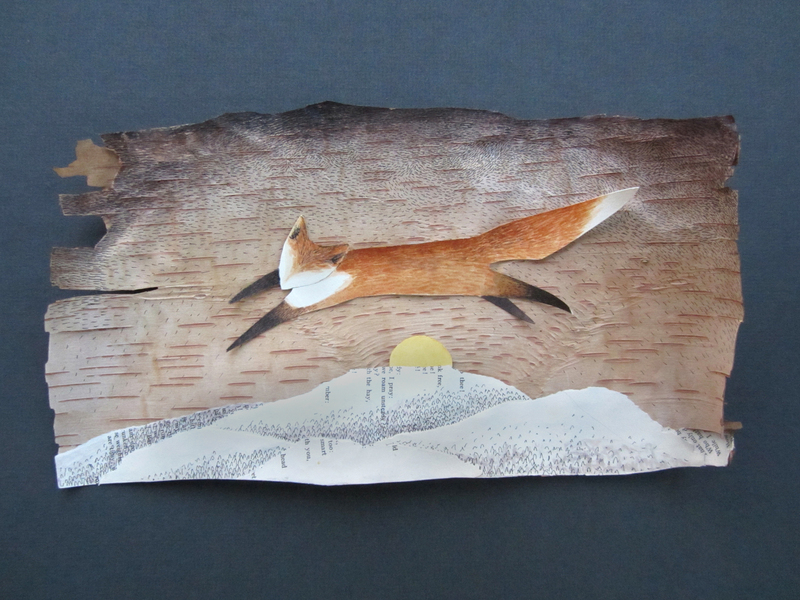 You can buy it online or maybe even find it in a used book store. The first problem that I came across was that I had nowhere to plant a garden. My constantly moving lifestyle doesn’t bode well with having land so for a while I panicked and then told myself to just trust and the perfect opportunity would arise. Which, of course, it did during a visit to Women’s Studio Workshop. After talking with Chris, the wonderful studio manager, I learned that they wanted to add a natural dye garden to their Art Farm, which currently houses papermaking plants and veggies. A hop, skip, and a jump later and we were digging out beds for the dye plants! I’m so excited to be helping out at this amazing establishment. 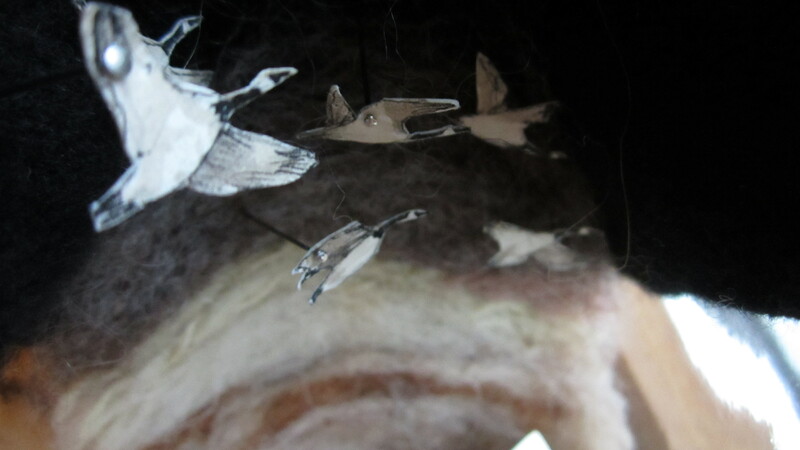 If you have never heard of Women’s Studio Workshop then don’t waste any time and check them out. 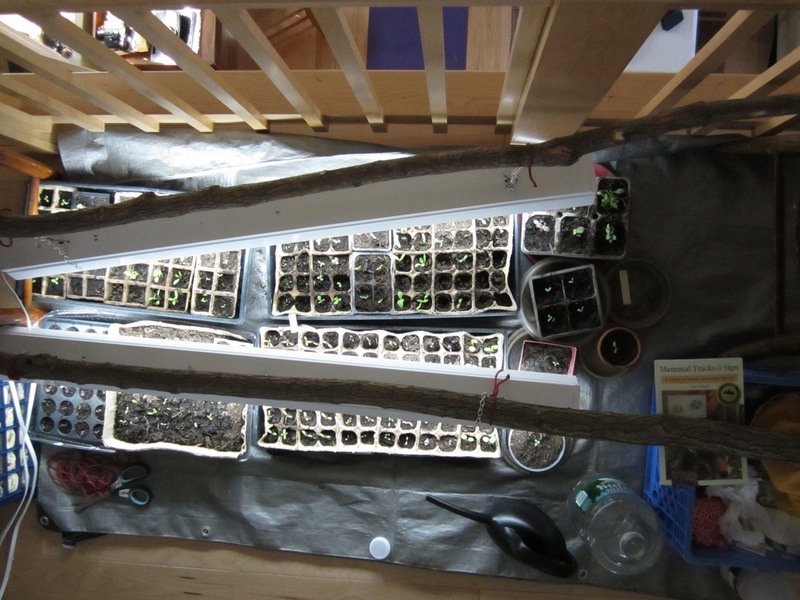 Meanwhile, learning how to start seedlings was definitely a challenge. I asked so many talented farmer friends for advice, consulted the internet and books, and was still terrified that nothing would possibly grow for me. 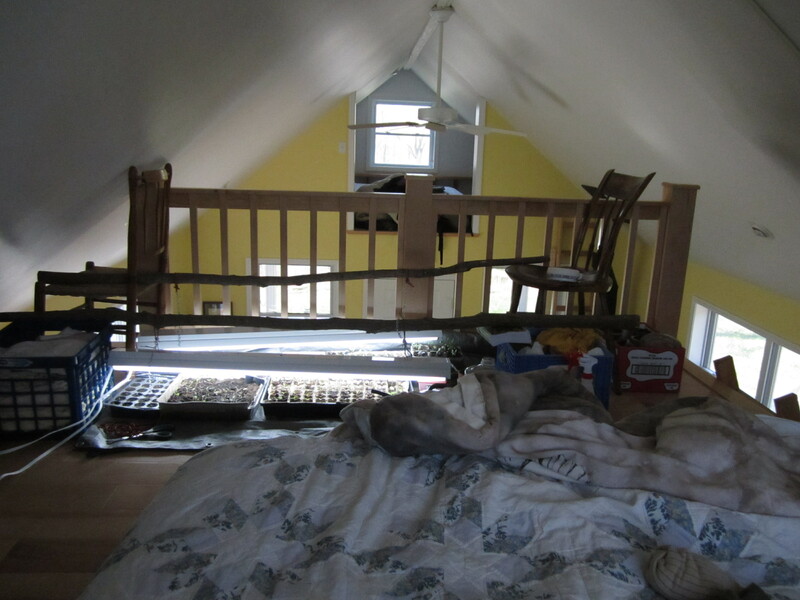 I ended up rigging a complicated and funny looking set up in the bedroom loft of the cabin I am sharing with my boyfriend. Who knew that chairs, milk crates, a tarp, shop lights, some locust branches, and a strategically placed copy of Mammal Tracks and Sign could create a place for plants to thrive? The million dollar question. I did a ton of research about which plants to start since I knew I had limited space and since this was my first garden. Whether to focus on a traditional dye garden or a restoration garden with native plants was the first thing I tackled. I eventually decided to do a traditional dye plants from all over the world, plus a few medicinal and native plants. I am still so excited to plant restoration gardens so if you are interested in having one at your school or community center please contact me. Even after deciding this it was still a journey to pick out the plants I would use. I wanted to get a range of color as well as use plants that either had a high yield or really interesting color. Plus, I just have some favorites : ) Here is my final list of plants that we are growing from seed. There will be a couple of extras purchased from starts if there is room. The hollyhocks, marigolds and coreopsis came up first, with the woad being a close third. Then indigo and purple basil. 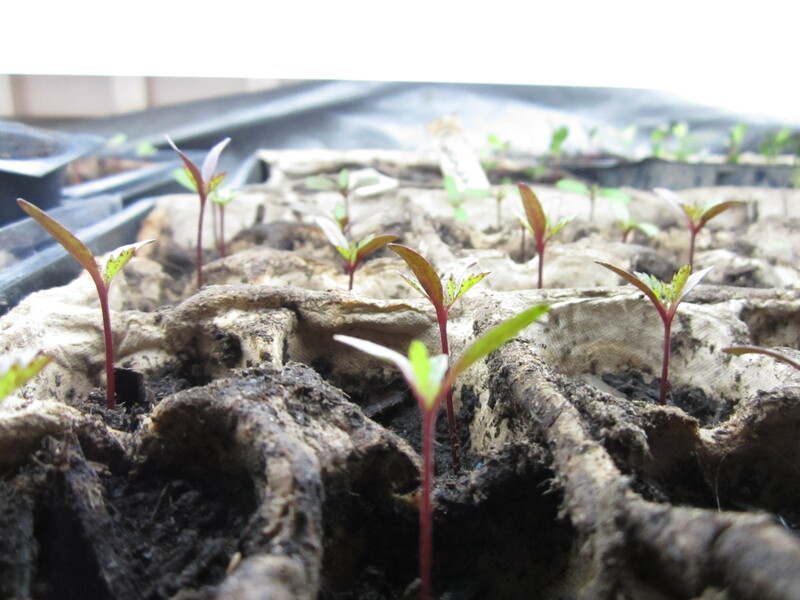 It was 13 days before madder and st. johns wort showed any signs of life. After that they really took off! 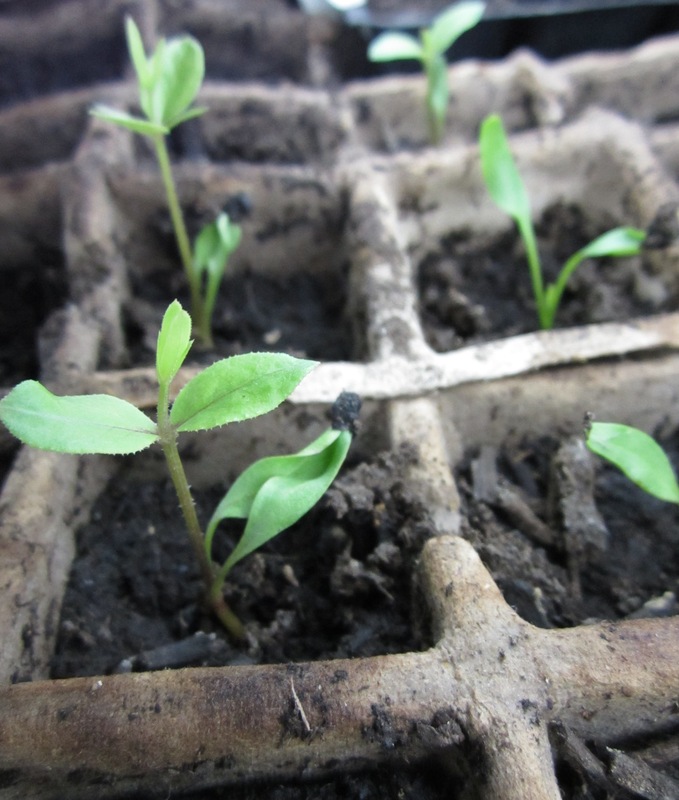 Unfortunately only 5 out of 25 woad seeds germinated (whats up with that?) and only poor little weld! I guess they just need something different. Kasia and Chris at WSW started a bunch as well so hopefully their weld and woads do better. Overall, I am incredibly thrilled. Check it out. Thanks, Mammal Tracks and Sign! You are crucial to the success of these plants. 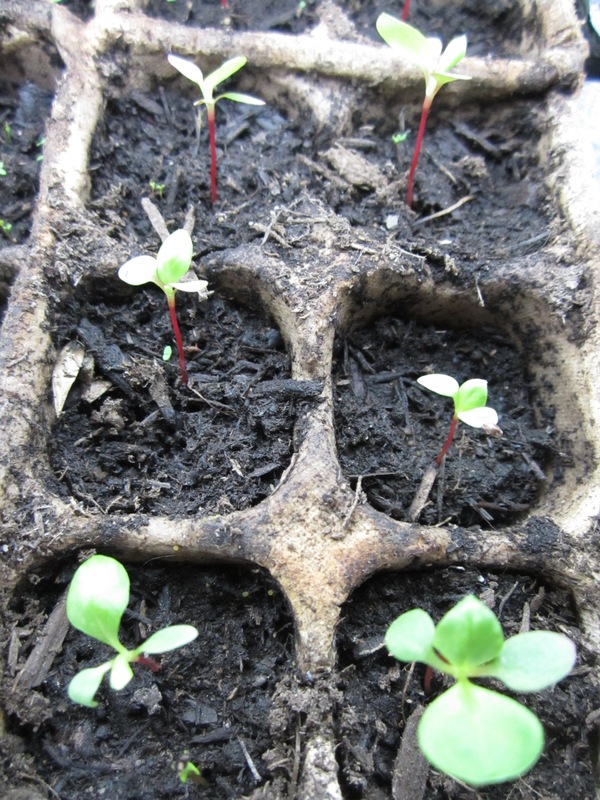 This post is a few years old so you may know the reason now but the reason woad doesn’t germinate very well (especially in a tray setting) is the seeds are coated in a substance, which I cannot remember the name of, which suppresses germination! Basically, this means you need to really overwater woad during the first few days of planting to wash the coating away. 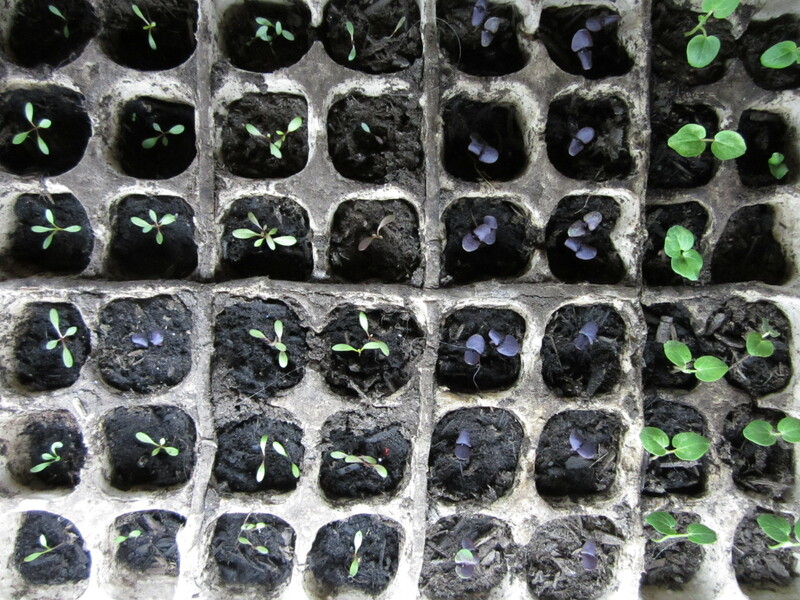 Would presoaking the seeds help wash away the coating and jumpstart germination? next post: Celebrate Stinging Nettles: A Recipe for Nettle Dye!